As it turns out…Everybody IS Kung-fu fighting. It’s appalling how violent we as a society have become. In the US, Cops are tasering, (I will NOT say TAZING. It’s not even a word. Come to think of it, neither is tasering. Nice to know that even though my vocabulary is going down the drain at least it’s going the urban dictionary way) everyone from family dogs to diabetics and even 72-year old women. We even got one of the most oft quoted lines of 2007 “Don’t Taze Me Bro” when university of Florida’s Andrew Meyer screamed in protest against campus policemen, thanks to this indiscriminate “tazing” that law enforcement officials have resorted to in the past few years. In India, on the other hand, we do things the old fashioned way. 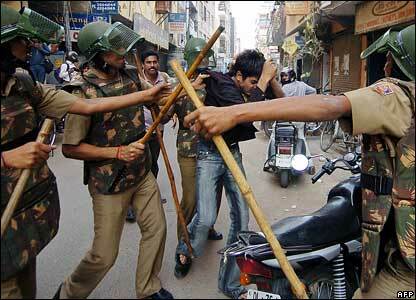 Police brutality, desi style is much of a lathi ( sticks) equipped, anger laced affair. So what if we don’t have tasers? In simple cyclical style, the story of police brutality in our newspapers and public consciousness goes in and out. Day 4: (Optional) An outraged reader writes a letter to the editor that finds print. So it’s barely a shock when one reads about the recent spate of violent attacks among the civilian population. We’re just taking a page out of the book that the police have been reading for years. Monkey-see, monkey-do. I'm not talking about these guys. In a recent incident at Malad, a mob lynched a man while he was caught stealing. After cornering him in a by-lane, they tied him to an iron gate and continued to beat him for the next 2 hours finally killing him. The residents of the colony that lynched the man in Malad said that the police didn’t bother to take any action when they complained so they decided to take justice into their own hands. Protesters against water-cuts, apart from getting killed, have taken to breaking into the offices of officials and beating the living hell out of them to the point that Bombay Municipal Corporation’s employees are asking for police protection. (This I find ironic and hilarious- The officials want protection from the people that are the inspiration behind this spate of public violence. There is so much beauty in the world, it blinds me.) A mob dragged a woman out of her house and paraded her naked after chopping off her hair becasue she allegedly had the keys to the tap that gave water for half an hour everyday for 50 houses. They also beat up her husband. And who can blame the people? While our water is running out, and our homes are getting robbed the Mumbai police are apparently sitting pretty doing nothing with complaints, or busy exercising their lathi arms with yet another guy in the lock up. It’s seems, more and more that the Indian justice system seems to have given up on itself- imploded under the weight of babus, courrupt cops and a public angry enough to take the law it it’s hands and dispense justice in the most primitive way possible. Everywhere you turn, everyone is now brandishing their own type of justice. Maara-Maari has ceased to be a cocktail juice on an Udipi restaurant menu for the folks in Mumbai and is now just another thing to do to keep our law and order.